The Avistar C3 Command™ solution puts intelligent bandwidth management for videoconferencing where it belongs: in the hands of a central administrator, simultaneously protecting individual calls, all unified communications, and other applications. Administrators control bandwidth consumption across user classes and network links using sophisticated threshold limits. This allows Avistar desktop videoconferencing to scale to thousands of users without taxing your existing network. Videoconferencing can put a strain on network resources, especially when hundreds of users are on video calls. Avistar provides a complete solution to this issue for both IT groups and OEMs or other Technology Partners who must ensure that unified communications do not overwhelm your network and degrade the performance of other key enterprise applications. The Avistar C3 Command™ solution, which is included in the Avistar C3™ Business Pro Edition, allows the administrator to set and fine-tune intelligent balancing of priorities of videoconferencing, users, and other applications. It gives control over the bandwidth used by audio and video calls to a central administrator, who can set policies to specify audio and video call rates based on class of user, endpoint capabilities, user preferences, and network conditions. For example, critical executives can belong to a user class who calls are governed by a preferential set of bandwidth policies. Second, it applies a limit on the amount of bandwidth that unified communications can monopolize, to control the impact on other applications. For example, one set of policies for a specific network link can govern bandwidth until that threshold is reached, after which another set of policies goes into effect automatically if preset by the administrator. Third, it protects the bandwidth needed by calls in progress to guarantee high quality of experience. This is done by calculating what unified communications needs in relation to other applications to function. 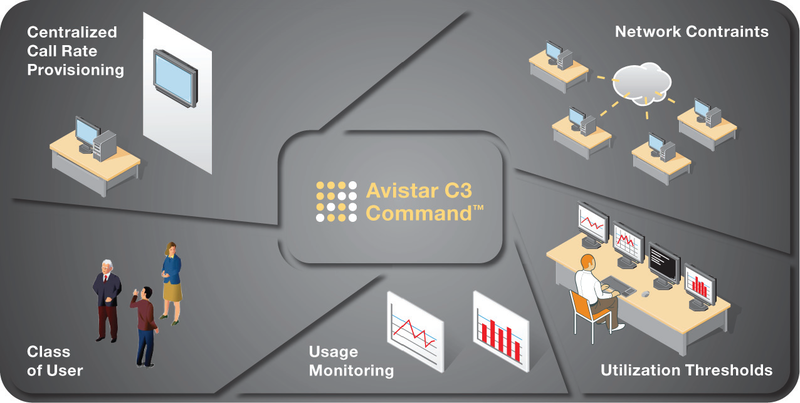 Unlike other bandwidth control solutions on the market, the Avistar C3 Command™ solution puts control with a central administrator rather than the user. By combining the policies governing network links, user classes and threshold limits enabled by the Avistar C3 Command™ solution, companies are able to implement a very intelligent and flexible bandwidth management strategy. It is part of the reason that the Avistar C3™ platform customers don’t require significant new network investments to support even thousands of active video users.